Best Days: Fri: small SE swell and early light winds in Northern NSW. May see a few stray sets at exposed northern ends in SE Qld. 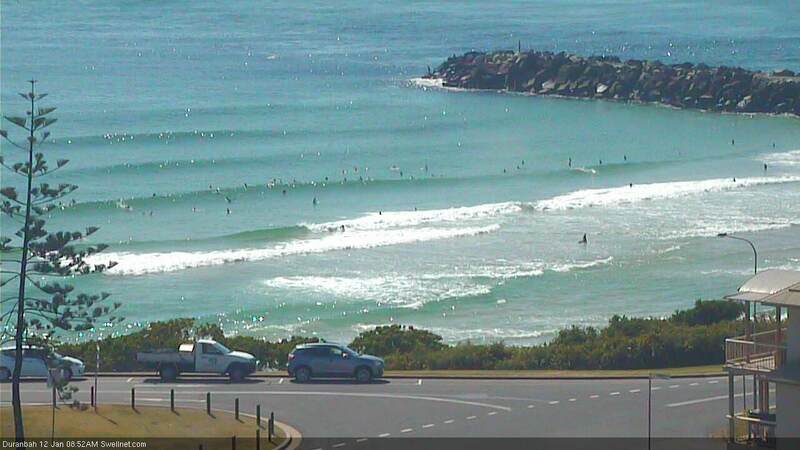 Sun: small N'ly swell early morning (mainly Southern Gold/Tweed coasts). Mon/Tues/Wed: strong, possibly large S'ly swell for Northern NSW, with good waves across the SE Qld points. Recap: A minor trade swell has provided almost-rideable waves across SE Qld beaches and Far Northern NSW, though winds have been out of the N/NE. Elsewhere it’s been tiny with a mix of small weak swells. Yesterday’s northerlies in Northern NSW went variable this morning ahead of a S’ly change pushing up the coast, currently midway between Evans Head and Byron Bay, with NE winds ahead of it. Let's cut to the chase: we’re not gonna finish the working week in style. Fortunately, northerly winds will be largely absent Thursday, and even most of Friday, thanks to a stalled trough off the coast that will otherwise provide very little value. As for surf, both days will continue to see minor aberrations in trade swell from a broad though ultimately weak ridge stretching from below New Caledonia through the Coral Sea. Most of the fetch is north of our swell window (so the resulting energy will be E/E at the coast) but it’ll barely nudge the rideable category at most beaches in SE Qld, and there won’t be much sign of it south from Ballina. Northern NSW will continue to see a meagre mix of minor windswells from several directions. As for swell prospects to our south: the parent low to today’s southerly is developing in the central/southern Tasman Sea however models have slightly would back its strength, which has marginally pulled back its surf potential (in size, and also timing). We’ll still see a flush of energy on Friday but the later peak in size - through the afternoon - will coincide with the less favourable conditions of the day. However there should be some decent peaky energy arriving throughout the morning, there’s just a slight risk of a delay across the Far North early morning. South facing beaches south of Byron should pick up reasonable 2-3ft sets throughout the day, but it’ll be smaller elsewhere due to the direction. Most SE Qld beaches will struggle to see much more than 1.5ft, however exposed northern ends may pick up some 2ft+ peaks into the afternoon. So, not too bad (especially if the wind holds off after lunch) but certainly not worth rearranging your diary for. Friday’s new SE swell is expected to hold into Saturday, but unfortunately an approaching front from the south will strengthen northerly winds about the coast, writing off all but the most protected northern corners. This airstream looks like it’ll become established pretty quickly so chances for an early period of light (or NW) breeze are slim. I’ll take a closer look in Friday’s update. The southerly change is expected to push up the Northern NSW coast just before dawn on Sunday, reaching the border around mid-morning and strengthening considerably into the afternoon. Saturday’s freshening N’ly flow should whip up some peaky windswell for exposed north facing beaches, with sets around 2ft+ (likely biggest around the southern Gold/Tweed Coasts) early on. This will ease throughout the day, and be replaced with a building short range S’ly windswell - though I’m dubious on the potential for the SE Qld outer points at this stage (fetch length initially too short, and too localised) but there is certainly a chance that the models may swing more in our favour over the coming days. Elsewhere, the southerly breeze will blow out most of the Northern NSW coast on Sunday and we’re probably looking at a junky windswell mix ahead of a better southerly swell due early in the new week. So, don’t make any concrete plans for Sunday afternoon just yet. A Tasman Low is expected to develop in the central Tasman Sea on Sunday, reaching a peak through Monday. Fortunately, compared to most systems this one looks very good for our region with the models estimating a slightly more easterly and northerly position than usual, along with a strong meridional alignment (north/south). And, there's certainly some dynamic potential in the forecast mix too, with the latest model guidance showing core wind speeds of 50kts and a potential captured fetch scenario as an approaching front slingshots around the low. There's a chance this could be upgraded further. At this stage we’re looking at a building mix of S tending SE swells from Monday thru’ Tuesday (easing Wednesday), and the height of the event - sometime Tuesday - could nudge the 6-8ft mark at reliable south swell magnets south of Byron Bay, with smaller though strong surf elsewhere. This size range will however be conditional on quite a few factors coming together - and my forecast is currently higher than the models are estimating - so I'm going out on a limb. But the synoptics are certainly quite promising at the moment. The good news is that this swell should work well for the SE Qld points, which will be under a moderate S’ly tending SE breeze both days (so, clean on the surface). The southerly component in the swell direction will cap wave heights compared to exposed locations south of the border, but right now somewhere around the 2-3ft mark looks plausible for the outer points between Monday and Wednesday, with Tuesday seeing a brief spike above this around 3-4ft. Expect bigger waves at exposed northern ends. There’s been a fair amount of shift in the models of late though so give it a few more days before locking down any plans. Anyway, this system is the focal point of the forecast period - so if you’ve got some flexi time up your sleeve it’ll be worth penciling in the first half of next week for some waves. And not a moment too soon! I really want to believe in this tasman low but the models seem pretty divergent this close to the event. Some look amazing, others, not so much. Come on Huey deliver the goods! Going to be @ the Surfers end of the Goldy Ben when this event delivers will it be clean enough for the beachies up that way or will we be restricted to the points? Models have moved around overnight (as anticipated). We're still expecting a major feature in the Tasman Sea, and it'll generate strong S'ly swells for the East Coast, but the models have moved it closer to Southern NSW (actually, and broadened the system too). As such there's no change to the forecast for Northern NSW - in fact Southern NSW will be upgraded - but the extra south in the direction has pegged back the size across SE Qld a bit. But, it's still early days. We will see many more adjustments between now and the genesis of this system Sat/Sun onwards) so expect things to move around quite a bit. 'Tis pretty small and grovelly on the Tweed Coast. But not flat. Watched a tiny little beachie this morning with no one out and managed to talk myself into going for a desperation grovel on an old twinnie. Actually ended up getting a few fun ones until a group of 4, then a 3 and then another 4 descended on the peak. 11 blokes in under 15 minutes on to one peak with 1ft waves. 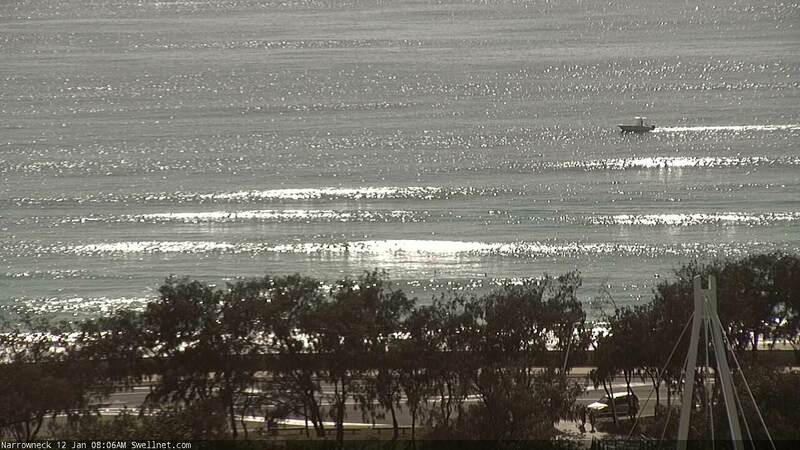 Hard to see properly with the glare but there's a few small lines getting into the northern Goldy this morning. 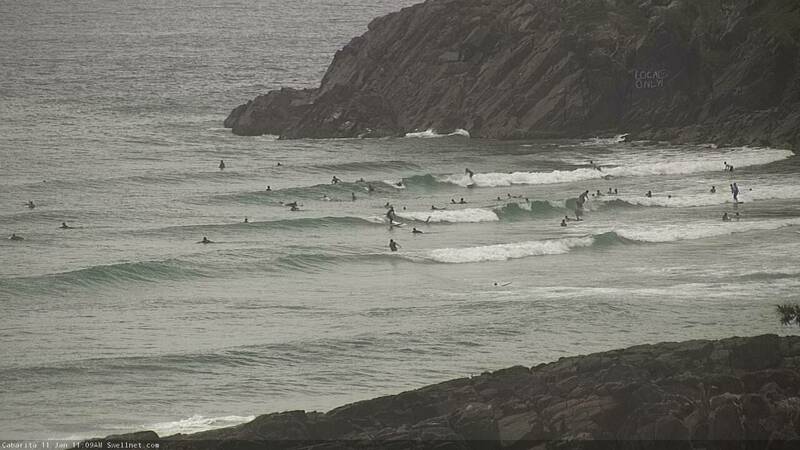 Yep, looks like the new SE swell is pushing into Northern NSW now, with some nice small lines showing at D'Bah. That predicted low almost looks "winter bomb like".